That is the name by which he was known in Sudan – Muhammad Ali Clay (pronounced cl-EYE). I’m not sure how he would have felt about that last addition, knowing how much he disliked his ‘slave name’, as he called it. But in a country where every other man is named Muhammad, and Ali is as common a surname as Smith, I imagine the Sudani-flavored ‘Clay’ helped make his name memorable to the nation. Since his death, the media has been pushing Muhammad Ali’s “transcendence”: how he transcended race, how he transcended religion. His Black and Muslim identity, which was at the forefront of everything he did and said in life, is now something he could (/should?) shed in death. They poured out faster than the punch he laid on Sonny Liston; everything from Time telling us “Why Muhammad Ali belonged to everyone” to the various RIP Cassius Clays, as if the man didn’t tell the world in his own words how he felt about that name, as if they knew better than he did about his own identity. But Muhammad Ali was transcendent, in my eyes. My childhood was a tug of war between the need to correct the damaged image of Black Americanness in Sudan, and make Africanness (because no one ever knew what or where Sudan was) visible and acceptable in America. Along with Malcolm X, Muhammed Ali was one of the characters who bridged my two homes and identities and spared me, even for a few moments, of this struggle. I was comforted in knowing that both of these important figures that I so admired visited my homeland and knew who the Sudanese people were, and that in a way also strengthened my sense of belonging to the Black community in the US. Muhammad Ali made an indelible impression on the Sudanese people. His accomplishments and persona were widely known, respected, and celebrated. 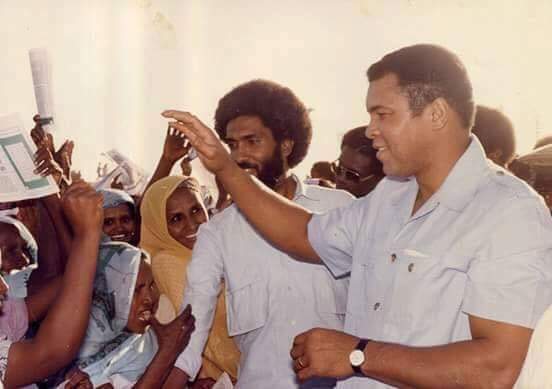 The proof is in our collective mourning; all day, my mostly-Sudanese social media feed has been flooded with heartfelt posts and photos of Muhammad Ali’s visit to Sudan. Other Africans were also sharing how the legend impacted their lives. Muhammad Ali, undeniably, transcended American history to become a symbol for the Black Diaspora at large. My bridge is now gone. And while I am saddened that the world has lost a man who taught it how to unapologetically follow one’s convictions, uplift one’s people and have the courage to, as my grandfather used to say, “tell Error it’s wrong to its face”, I am relieved that God has granted him peace and ease from ailment. 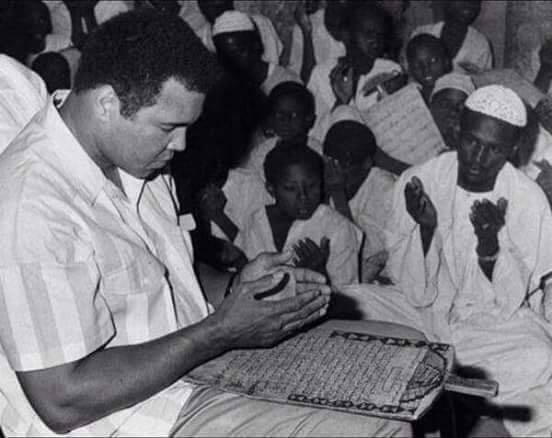 Today, the people of Sa’ad Al’agleen, a village Muhammad Ali visited on his trip to Sudan in 1988, held prayer in memorial of The Champ. Rabbana yar7amak ya Muhammad Ali Clay, w ysabbir ahalak. Tags: Black Diaspora, Muhammad Ali, RIP, Sudan. Bookmark the permalink. Muhammed Ali , was one of few of poeple who had changed the world views about balck Americans .a sample of integrity and faith . He suffered alot because of his ideas and principle but fought relentlessly in all fronts and never retreated or applologized for what he a right stand . Ana Sudani and I can very well say I am proud Muhammed Ali visited Sudan. Yes, it’s nice knowing he did that to bridge the gap between Afro-Arab Sudan and the western world. I don’t think that’ll ever happen again. The guy was an intellect, a fighter against racism, discrimination,oppression etc. He was probably the most loved iconic figure of the 20th century. He makes the word legendary sound so small. 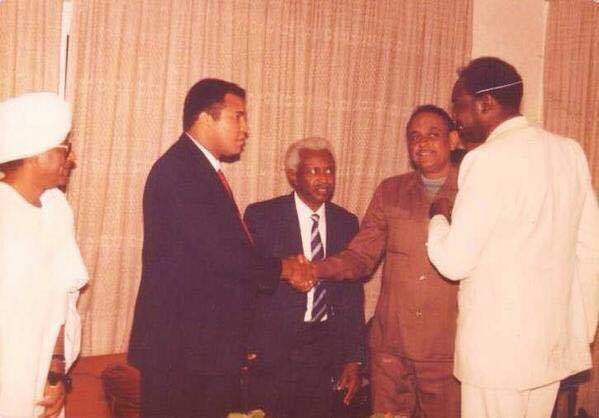 The legend Mohammed Ali Clay has a great esteem among the Sudanese people.